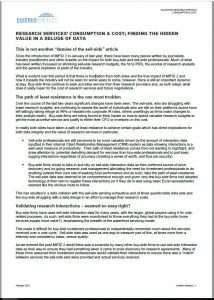 Since the introduction of MiFID 2 in January of last year, there have been many pieces written by journalists, industry practitioners and other experts on the impact for both buy-side and sell-side professionals. Much of what has been written focussed on shrinking sell-side research budgets, the hit to IRPs, the exodus of research analysts and the general implosion of parts of the industry. The path of least resistance is the one most trodden ……..